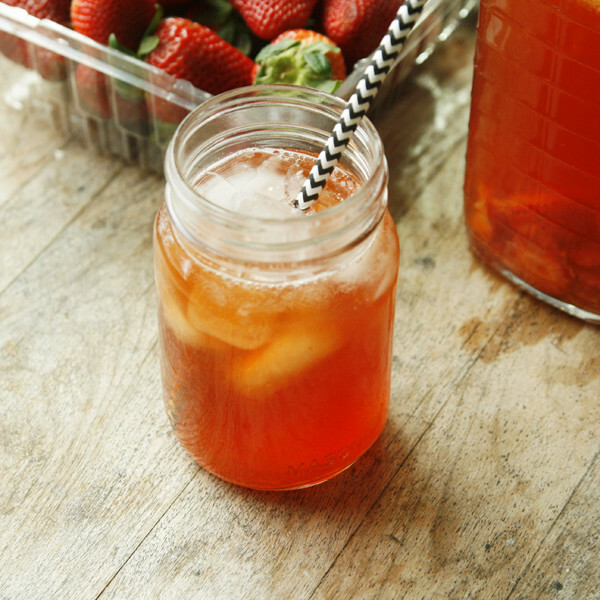 Fresh strawberries, lemonade and ice tea combine in this creative recipe for Strawberry Iced Tea Lemonade — a perfect spring and summer drink. New neighbors moved in recently, setting up a gas grill near their rear porch. A tan grill cover conceals it most of the time, but on warm nights they uncover it and the aroma of juicy burgers wafts in my windows. It’s the smell of relaxation, of summer nights and days of freedom. Outdoor cooking is as much as part of warm weather nights as later bedtimes, shorts and cool drinks. It also reminds me how much I miss grilling. When we moved here, my grill didn’t come with us. At the time, the landlord didn’t want grills kept on the porches, and storing them near the porch wasn’t an option. I guess it is now. Last summer, missing grilling, I bought a tiny portable camping kettle barbecue and grilled once. Low to the ground, and really, really small, it was an experience. I wouldn’t call it a complete disaster, but with an abbreviated number of briquettes in the kettle, the fire burned out faster than anticipated. Live and learn. Perhaps we’ll try it again this summer. Or maybe I’ll cave and buy a new gas grill. Who knows. In the meantime, I will live vicariously through the sniffs of grilling at the neighbor’s unit. 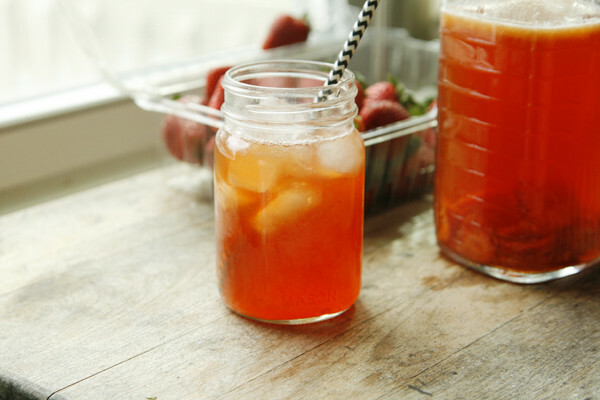 And I’ll claim my stake on the approaching summertime in other ways — like through this Strawberry Iced Tea Lemonade recipe. It’s delightful. Iced tea lemonade, sometimes called a half and half or an Arnold Palmer, has long been a favorite of mine. I first sipped it in a beachside cafe in southern New Jersey more than 20 years ago. I still remember apprehensively ordering it for the first time, on the recommendation of my friend’s mom. Taking that first sip, I was surprised how wonderful it tasted — not too sweet, not too unsweet. Just sweet-tart-herbal perfection. But why limit this refreshing drink to just the usual unsweetened iced tea? That’s where Strawberry Iced Tea Lemonade comes in. 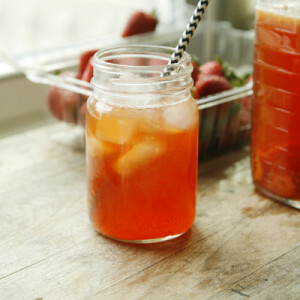 For this recipe, I used strawberry tea that I found at a local grocer. 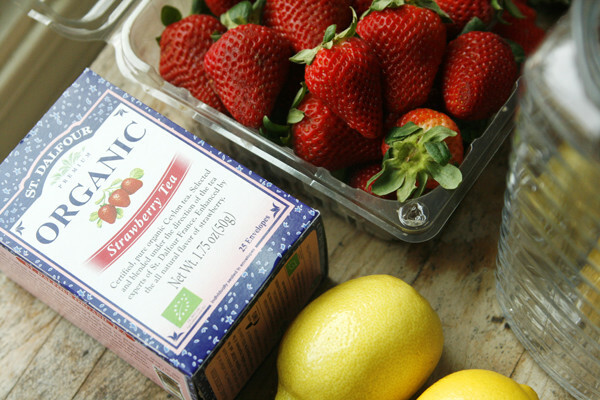 Since I adore strawberries, I couldn’t imagine not liking this tea — and I was right. But if you can’t locate strawberry tea, a wild berry tea would work well too and that’s pretty widely available. To make this, first you need to squeeze some fresh lemon juice. I have one of those clever green tools for squeezing lemons, but an old fashioned juicer that fits on a glass works just fine too. In fact, I prefer it. Then you need to make the fresh strawberry simple syrup, which is a simple concoction of equal parts sugar and water combined with sliced strawberries. It turns a brilliant shade of red. Finally, you brew your tea — strongly. Then you mix it all together, along with a little more water, and chill it. The ruby red drink is sweet, with hints of tartness and herbalness, and it’s delightful served cold over ice. This a delicious, refreshing, summery drink that will totally get you in the mood for warm days and sand between your toes. And grilling too. In a small saucepan, combine the sugar and 3/4 cup water. Heat, stirring constantly, until the sugar dissolves in the water. 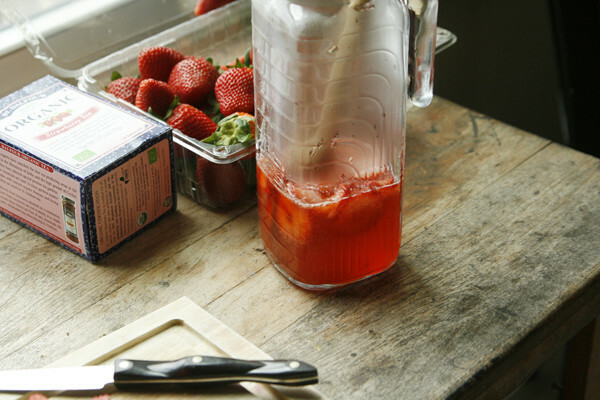 Add the strawberries and continue cooking for 4-5 minutes, until the berries are softened and the simple syrup is pink. Pour into the pitcher. Heat 2 cups of water to boiling. Remove from the stove and add the tea bags. Seep, per package directions (about 2 minutes). Then remove tea bags and pour into the pitcher. Stir well. Add the remaining cup of water. Stir. Chill until ready to serve. Best served cold, over ice. This looks like the perfect accompaniment to something from the grill. I love the smell of food on the grill wafting through the air and into my window, too…comfort! I plan on drinking this all summer! Love this! This sounds perfect for sipping by the pool. The summer smell of grilling makes me so happy. We can’t have a grill where I live right now and it kills me. As soon as it’s summer I want to grill all the time! However, I’ll happily sip on these drinks to make up for my lack of grill. I love the look of the strawberry tea! 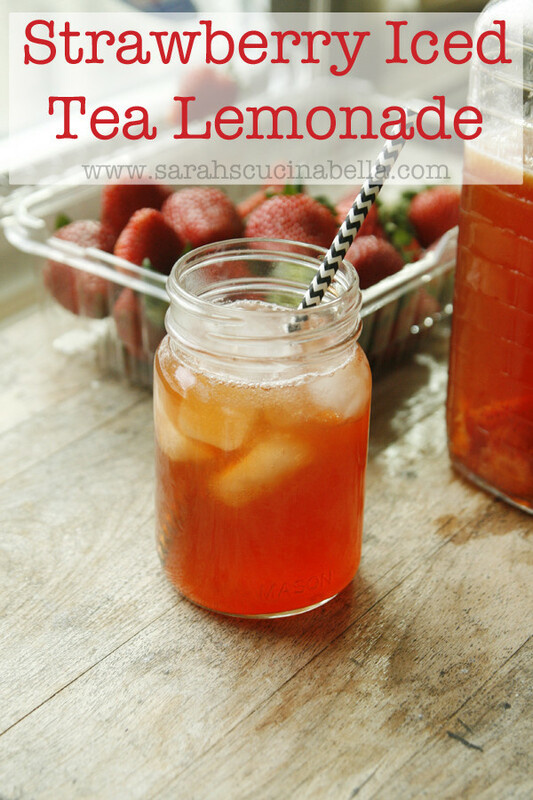 I love strawberry lemonade and am a tea addict, so this is right up my alley! I can’t wait to start grilling more too. I use to love charcoal, but have gotten so use to propane. It’s so easy, love it! Yeah cooking outside has some special qualities; I get all jealous when the neighbors grill 😉 This iced tea looks just perfect! I mean – you just can’t go wrong with strawberries – yum! A favorite restaurant we go to servers strawberry lemonade and I’ve always wanted to make some at home. I never have. Yours looks delicious. I’ll try your recipe! I’m always curious which neighbor is grilling when I go outside and catch the aromas…hoping they’ll give me something to sample:) A very refreshing tea that’s perfect for the hot summer days that are on the way!